LeisureCats have always practically defined the active side of boating, and the review boat more than most. The owner of this 350 Sportscruiser is now on his fourth built to order LeisureCat and is confident he has achieved his version of perfection. This all new model is available in any length between 11.6m and 14.1m, and the owner went for the maximum. The whole of the extra 2.5m is in the after deck giving all the space an avid angler, diver and pot puller could dream of. That length also meant extra under deck volume that has allowed room for auxiliary machinery spaces. These accommodate a compressor for surface air supply, a genset, a 24,000 BTU air conditioner and, because long range cruising is planned, a desalinator to supplement the 520 litre fresh water capacity. The accommodation is capacious, but this is clearly a boat where life is mostly lived in the open air. A table with room for eight folding chairs is where eating generally takes place. Cooking too sometimes; the table has sockets for the barbecue as an alternative to the rail. Other pieces of civilisation on the after deck are a bathroom, a wet bar and ice maker. A fisherman would consider the pot winch, tipper and the spectacular bait station with adjacent sink as also civilized. A hardtop shades the forward part of the after deck; mounted on top is a RIB, also made by LeisureCat, launched by hydraulic davit. The choice of fit out materials is what you would expect from a man who intends to really use his boat: low maintenance. The saloon deckhead is in hard synthetic material, the bulkheads where not in timber are sheathed in carpet-like material. Decks throughout are sheathed in teak-look synthetics. The saloon, though not over large, uses space well. The galley extends entirely across its forward bulkhead in a layout to please a dedicated cook. A fridge is incorporated, and a second is located under a corner of the large saloon table. This, with its associated settees, will accommodate a sizeable family for dining or TV viewing, although this outdoors minded family will probably use it only when seeking the refuge of air conditioning. Sleeping accommodation is within the hulls, which have enough volume to comfortably sleep seven; they are housed in two double and one triple cabins. Also within the hulls is a second bathroom. 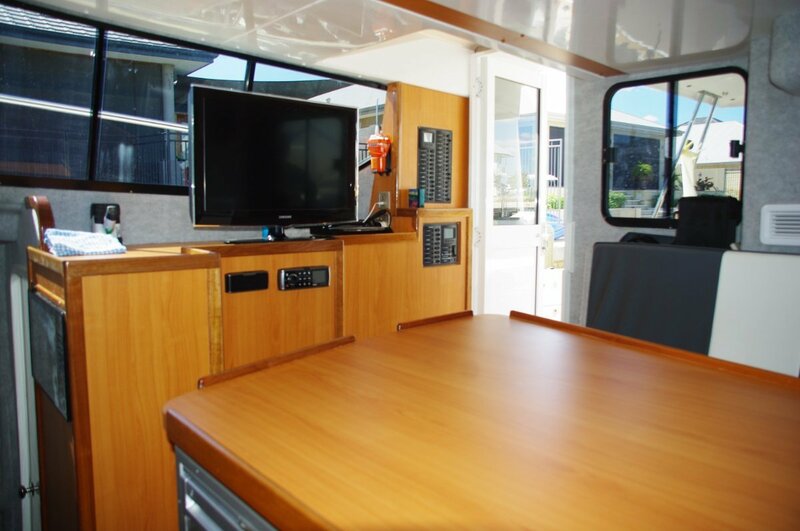 By catamaran standards, and by the standards of a lot of monohulls, this is a luxuriously large compartment. The single control station is on the flybridge, reached by excellent stairs, which is large enough for the whole family. The two senior members get superb seats facing a console with fish locating electronics to set an angler’s mouth watering. The juniors share a settee, but have quicker access to the drinks fridge. Being a catamaran the 350 has a large foredeck, and access to it is very good. The side decks are wide enough for easy walking; grab rails for one hand and side rails for the other make progress secure. A pair of D6 Volvos putting out 400 hp each propel the 350 through Duoprop sterndrives. These are the most powerful engines these units will accept and performance is as brisk as you would expect. The owner, though, has more than outright performance in mind. Using the built-in fuel consumption electronics he has determined that at 24 knots – a typical cruising speed – the 2,000 litre fuel capacity is good for 720 miles, a creditable result. However cats are renowned for economy at moderate speeds and, stunningly, he found that dropping to 12 knots increased range to 1,950 miles. Extended Kimberley cruising has long been in his sights and now he has the boat for it; who wants more than 12 knots in those waters? 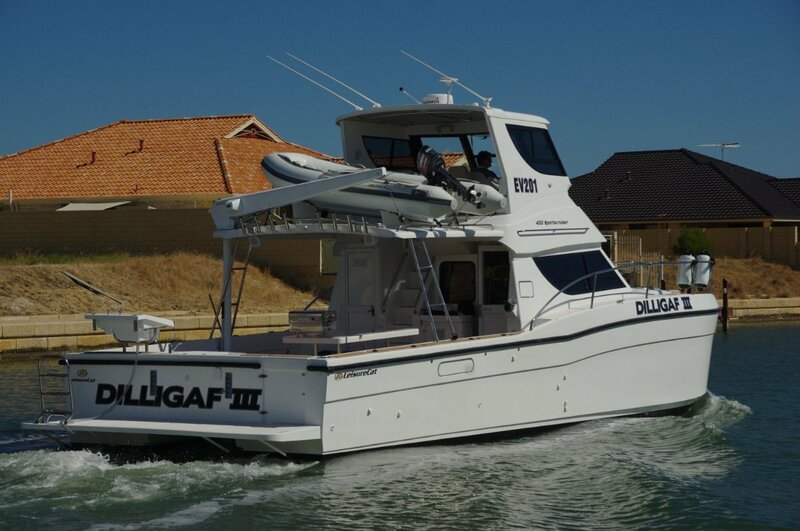 LeisureCat quote prices for their larger vessels without motors; motor choices of customers ranging from outboards to inboard diesels of all powers. Naked of power an 11.6m 350 Sportscruiser is $399,000. The larger review boat, with all the extras the owner specified, can be duplicated for $895,000.